Leading up too the San Diego Global Fitness Expo, here are some tips from one of our expert coach, Matt Thomson from DIY Fitness, NY. Treadmills are fantastic machines that make running safe and convenient. In the winter when the roads are slippery, you can just hop onto the platform instead of taking your chances with the icy surface. In the summer when the heat can be unbearable, you can still get your workout in at any time of the day. Even Olympians and competitive athletes use these machines to avoid injuries and boost their performance. Regular people can utilize treadmills to accelerate weight loss while minimizing joint impact. The key is to run consistently and provide enough stimuli to keep things interesting. It’s simply more fun to exercise to the tune of your favorite music. 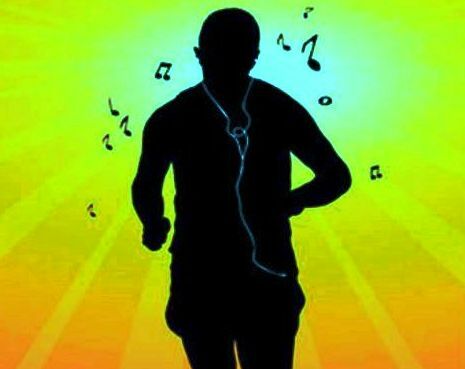 You can vary the songs to suit your mood and your planned workout. For example, if it is going to be an easy recovery run then slower beats are ideal. On the other hand, intense cardio requires high octane beats to get your heart and legs pumping. Studies have shown that music increases performance and you are less likely to notice the time passing by. Get a good set of earphones for your music player that won’t fall off easily or hurt your ears during long runs. Some people prefer listening to audio books or podcasts instead which are excellent ideas, as well. 2. Pick up the speed. Countless runners make the mistake of plodding at a single pace day after day. While this makes them highly efficient at that pace, they quickly reach a plateau and unfortunately stay there due to the lack of stimuli. They are able to sustain longer efforts but they never develop speed. As the saying goes, “In order to run fast, you have to run fast.” Train your body to get used to a faster leg turnover by bumping up the treadmill settings every once in a while. Have a speed session one day a week and you will notice big improvements in your records after a few months. 3. Fire up the incline. Most treadmills have platforms which can be tilted upwards for a more challenging workout. The incline is measured as rise over run expressed in percentage. For example, a 1% grade means that the treadmill is simulating a hill that rises 1 meter over a length of 100 meters. The maximum setting is typically 15% grade which is enough to make even seasoned runners sweat. Have a weekly hill session on your treadmill to strengthen your leg muscles. Just remember to do things gradually. When we give our bodies need time to adapt, we can come back stronger and fitter. Be mindful of your post-run routine. Recovering properly will help you to bounce back quicker from hard workouts. This means you won’t have to skip sessions due to fatigue and soreness. You will feel good enough to continue every day so you will be able to reach your goals sooner. The trick is to consume a good amount of carbohydrates and proteins within 30 minutes after your run, ideally in a 3:1 or 4:1 ratio. A chocolate milk drink or a protein shake will do well. Within two hours, try to consume a heavier meal and drink more fluids. Be sure to get enough sleep every night to wake up refreshed the next morning. Contrary to what some might think, running on treadmills can be a fun way to burn calories especially when the weather is less than optimal for outdoor excursions. These machines also benefit people whose joints may not be so tolerant of hard pavement. Treadmills can go a long way in helping people achieve various fitness objectives, in this Fitness Expo review we will take a closer look at the Sole F80 Treadmill. This particular workout equipment is designed to help users achieve different training programs that include endurance and intensity training as well as wimple workout maneuvers. There are several such products existing in the market and finding one should not be a daunting task. However, not all treadmills offer the same convenience and efficiency. When looking to purchase a treadmill, whether for personal training, weight loss or fitness facility, there are a few things to consider. Issues of comfort, quality materials, smart features, safety and convenience are among top aspects to evaluate. Sole F80 is one of the most popular and most reputed product coming with enhanced features designed to increase comfort as well as workout quality. Here is a descriptive review including the Sole fF80 treadmill product specs and benefits. Deck – Most treadmills have decks made of asphalt and other materials that often meet the basic requirements for jogging, fast-paced walking and running. While these surfaces are fairly comfortable, the Sole F80 is designed to bring in more comfort and allow users to achieve maximum ease when working out. It utilizes a proprietary Cushion Flex Whisper deck that has been proven to increase comfort by reducing impact (by up to 40%).This means jogging or running on this deck will have minimal impact on your joints thus preventing injuries and straining. Motor system – The Sole F80 features a 3.5 Chip DC-type motor that is capable of providing a wide speed range (from 0.5 to 12 MPH). This is integrated with a 0-15% rack-and-pinion gear incline that enables users to access 15 different levels of incline. The HP motor delivers challenging speeds and the treadmill also comes equipped with monitoring features that include a chest strap (for heart rate) and pulse grip. Program options – When looking to purchase a treadmill, it is important to choose products that offer varying programs that help in achieving distinct workout objectives. This treadmill does not only offer a perfect engine and comfortable running deck but also comes equipped with 6 different standard training programs. 2 programs are for the heart while 2 others are custom programs that can be manipulated to help the user meet their unique requirements. Ergonomic LCD display – The display is not often as crucial as deck and engine. Nonetheless, it is still preferable to have treadmills that have ergonomic displays that are easy to read and navigate. Sole F80 provides a wide 7.5 inch LCD that displays all the metrics collected during the workout enabling the user to track their progress. The display is easy to use and depicts safe brightness allowing view from a distant. You do not have to lean in to see the progress. Other features – Workouts require maximum comfort especially since the activities often demand a lot of energy from participants. F80 exhibits comfortable deck, cooling fans and breeze as well as MP3 compatible entertainment system to keep users active and relaxed. There is an emergency start/stop switch that is helpful especially during accidents and falls. The grip and heart monitoring straps are wireless to remove bulky cables out of the way and create ample space for running. Quick-adjustment controls are evenly distributed on the handle bars to allow quick controlling of workout intensity without having to reach out. Additionally, the mill has a patented safety-lock that locks it firmly on the ground when in use. There are several other minor features integrated into the compact design of Sole F80 treadmill. This fitness equipment has a large running deck measuring 35 by 80 inches and a 375 pound weight limit which is perfect for most people. The treadmill weighs about 265 pounds and has swift rolling wheels for easy movement and storage. 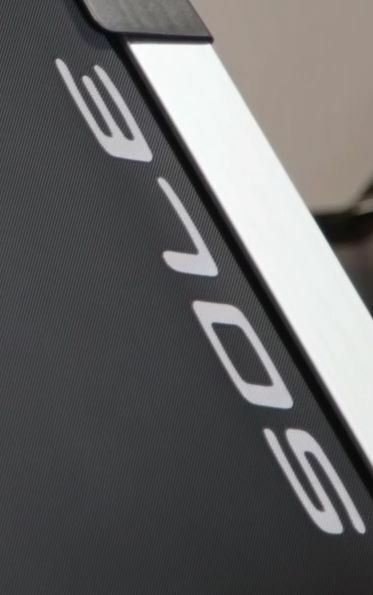 Sole F80 treadmill product specs are unique and enhanced when compared to other alternatives that exist (even when compared to other Sole Treadmills, such as the Sole F85). The advantages of using this product are quite straightforward and obvious. Most treadmills that fall in the same quality range are way expensive and less often match the comfort F80’s proprietary deck offers. The construction of this tool allows for 15 different inclines and also depicts comfortable handle bars that users can hold on to find their balance. The deck and most of Sole F80’s design parts come with a desirable lifetime warranty. The manufacturer offers lifetime warranty on motor and deck with a 5 year warranty on electronics and 2 years on labor. Their warranty covers defects in material as well as workmanship. This treadmill has a wide LCD display that is very easy to use and does not require too much navigation to view your stats. The comfortable impact-absorbing deck features 2.75 inch rollers that are powered by a HP motor. 0-12MPH is a perfect speed limit that most people can work with in their different fitness activities. The Sole F80 Treadmill Top Fan. The mill also accommodates users of weights up to 375 pounds covering most of the population. Moreover, accessories such as pulse grip and chest strap allow accurate heart and pulse monitoring in the most convenient ways. The most critical features that people look for in workout treadmills include comfort, efficiency and durability. All these F80 guarantees and delivers to the expectation. The system is integrated with wireless straps, quick-adjustment handle-bars, emergency stop switches and guide message boards that engage the user throughout their workout. Lastly, users can enjoy music and entertainment from their MP3 or iPods through the integrated stereo speaker system. The Sole F80 Treadmill has received many reviews and recommendations by both experts and users. Most people who have purchased the product remark its comfort and ease of use. The design exhibits a low-profile running that prevents your feet from touching the belt edge and precision-welded frame increases longevity. When looking to purchase this treadmill, it is important to always choose licensed credible retailers/distributors who can guarantee original genuine products only. This will ensure you get durable equipment with all the warranties offered. Treadmill desks: A 1-year prospective trial. The Sole F85 Treadmill has been deemed one of the best folding treadmills on the planet. Updated: We are in the progress of updating this review to cover feed-back from our readers. It has also been deemed a “best buy” in the fitness machine industry. It’s one of the best reviewed running machines around.This is because this particular model is SOLE’s best seller. This treadmill is popular because it incorporates all the product specifications of the SOLE’s previous model, F83 in addition to featuring one of the highest horse power motors that the company has to offer. This is truly an impressive motor featuring a Continuous Duty HP motor of 4.0 and output that can’t be matched. This is at top of the line treadmill that cannot be beat by any other company. It features the best of the best in terms of motor and quality. Some other aspects that make the F85 harder to compete with include the 22′ inch wide running surface. This wide running surface is comfortable for any type of runner. This makes it one of the best folding treadmills, it is unheard of to offer such a wide running surface, yet still fold up. The controls allow you to speed up to twelve mph with just the tough of a button. In addition to a wide surface and twelve mph speed, this treadmill also can handle runners up to 400lbs. This truly is a game changer in the treadmill industry. The Sole F85 has six auto programs as well as the ability to feature customized workouts for up to two people. It offers heart rate control programs for up to two users as well. The SOLE comes fully equipped with the usual programs found on treadmills all featuring customization. You will not miss out on anything with this treadmill. When it comes to the control options for the heart-rate you it will automatically calculate what your recommended target range should be according to your age. This saves you a lot of unnecessary math. This allows you a comfortable, safe, and efficient workout. In addition to the heart –rate calculator other features offer a low-noise deck as well as shock absorption treadmill deck that is cushion flex. The belt is of commercial grade and there is a low-profile running hood. The treadmill also comes with incline controls as well as speed controls on the arm rests to help control the machine better. While working up a sweat you can certainly enjoy the built in cooling fans that have been added for user comfort. The console of the treadmill features a user friendly vibrant display along with a message board. The message board offers clear instructions for the programs being used as well as feedback. Information such as speed, incline, distance, calories, pulse, pace, and time are always featured. In addition to the display there is also a ¼ mile track and a Peak and Valley graph that comes with different programs. 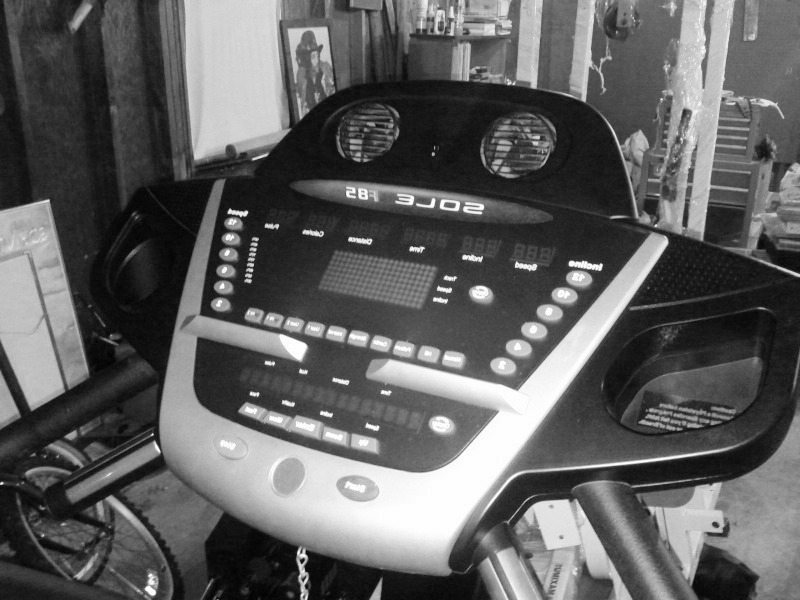 The console of the treadmill also offers built in speakers that allow an MP3 or iPod hook up so that a user can listen to their own music while working out. These are just some of the features that truly set the F85 apart from other machines. The belts used for the SOLE f85 are woven twice and feature a 2 ply. There are four layers of belts on the treadmill. Two of the layers are rubber that is laid over the middle PVC layer. The PVC layer has a nylon backing that then rolls over the rollers and the deck. 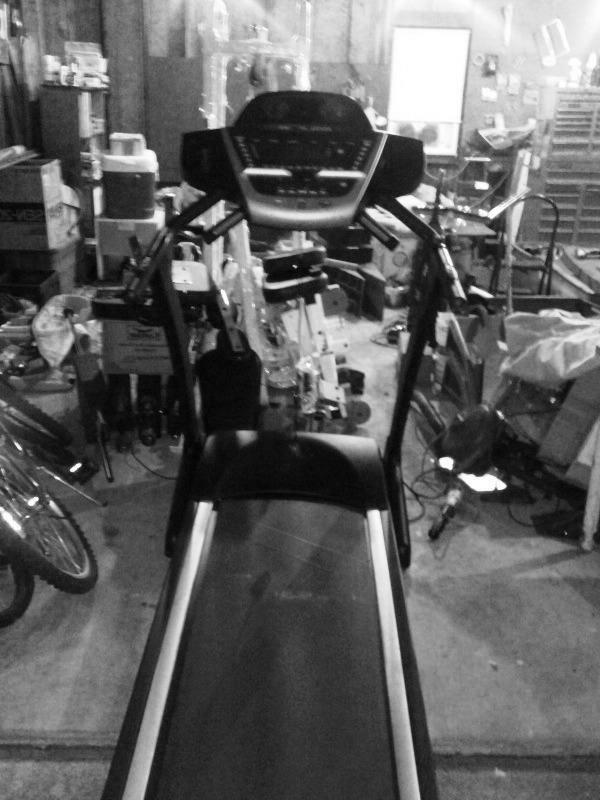 The rubber is a standard in all treadmills as it provides durability. The PVC belt is what stops the actual belt from over-stretching. The nylon allows for a smooth surface so belt can glide easily over the deck and the rollers. Another feature is that the frames of the treadmill are so sturdy, that they are actually bullet proof. The frames are made of an epoxy powder coated paint that is baked into the appliance to complete the durability. This type of finish protects the construction of the all-steel frame. The steel is welded, not bolted which makes a big difference (Insider training, Runner’s World). It makes the frames indestructible allowing for a lifetime warranty on the treadmill. When it comes to treadmills it does not get better than the F85 SOLE. This treadmill offers the best in technology, innovation, style, and ease of use. 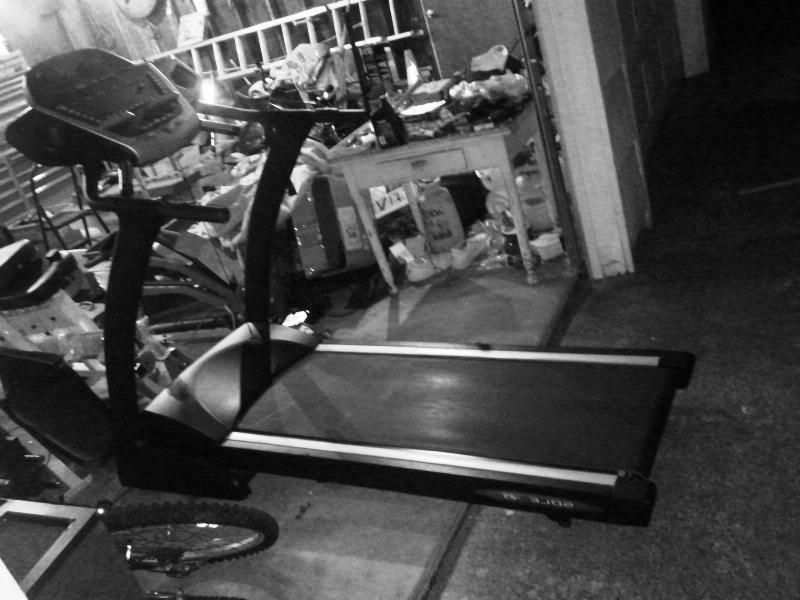 From the message board to the bullet proof frames the treadmill is virtually indestructible. To think that this piece of equipment is also able to fold up is amazing itself. When it comes to the fitness industry, the SOLE offers incomparable machinery. The 22′ running surface as well as the weight capacity for 400lbs also makes this a game changing treadmill for the industry. The price is perfect for the treadmill truly making it a “best buy”. The SOLE F85 treadmill is known as the best folding running machines on the planet. Horizon fitness is an industry leader in the manufacturing of exercise equipment. They have been supplying consumers and health clubs with high-quality and functional equipment since 1975. They have a built a reputation for themselves by providing excellent customer service with attention to detail and to meeting the needs of their customers. Horizon fitness specializes in the construction of treadmills and ellipticals along with exercise bikes. Their products are designed to be long-lasting, whether they are manufactured for the home fitness center or for larger fitness institutions. Many consumers feel that their products are of great value for the expense. The company strives to make certain that their products are comfortable to use without compromising on quality. Another great aspect of Horizon Fitness is that they make certain that their products are fairly simple to put together. Assembly instructions are clear and there are often links to instructional videos for those customers that need further assistance. In addition, they have an extremely helpful customer service department that actually knows and understands the products. This allows them to offer expert advice to those customers who need instructions dealing with assembly or use. Horizon is so confident in their products that they offer a full refund within 30 days to those customers who are not completely satisfied with their experience. In addition to exercise equipment, the company also offers lubricants such as silicon oil. This product helps to keep machines such as treadmills operating at peak performance levels. Fitness mats are also available and these mats help to protect the flooring that is underneath equipment. It is this type of attention to detail that keep customers coming back to Horizon Fitness for their exercise equipment needs. The company also offers extended warranties that allow customers to guarantee the life of their products for many years. More information at their website. Copyright © 1999 - 2018 www.sdgfexpo.com - All Rights Reserved.